Many travellers ask me for tips and advice for driving through the Australian Outback. Everything you need to know about these kind of drives is covered on the previous page about travel in the Australian Outback. But not all the Australian Outback roads are sealed. In fact, most of the roads out here are unsealed, and many require a four wheel drive vehicle. Some travellers are more adventurous than others, and some have more time to explore. Many would like to get off the beaten track, and we all enjoy getting away form the other tourists, don't we? Many of the unsealed Australian Outback roads are well maintained gravel roads. This is particularly true for roads to major tourist attractions. Mostly 4x4 is not necessary. Rain can cause wash outs, creeks can flood the road, and bog holes can remain long after. But what if the road is not a popular, well travelled route to a big tourist attraction? If you want to leave the bitumen and drive in the real Australian Outback make sure you find out about the present state of the roads first! Enquire at the next tourist centre, or simply ask the locals. Ask the police, the rangers, the petrol station, or even at the pub. If you have access to the internet check the links on this page for Australian Outback road reports and more Outback information. And read on about the hazards and difficulties you might encounter on such a drive. To start with make sure you have proper directions and a very detailed and current map of the area. If you have no experience with 4x4 and are renting a car, make sure you know how to engage the four wheel drive. I'm sure you want to avoid a scenario like that of the couple from the Netherlands who got bogged in Litchfield National Park (not exactly a deserted part of Australia). They activated an emergency beacon (for life threatening situations only) which of course caused a huge rescue operation. The rescuers arrived, engaged the four wheel drive and drove the car out of the bog... So, please! If at all possible, don't go it alone. The best way to avoid trouble is to find some other vehicle to accompany you on your drive through the Australian Outback. One more easy way to be safe: Let someone know what you are up to! Tell someone where you are driving and when you intend to be back/arrive at your destination. When you do arrive don't forget to check back in. Another hazard that is made worse by speed is the danger coming from sharp edged rocks on the road. Dusk and dawn are the most dangerous times for driving, it's best just to have a break instead. I guess I should mention the locusts (a kind of grasshopper). Here in the north we get big swarms of them at the beginning of the dry season. They clog up your radiator in no time and several tourists cook the engines of their cars this way every year... Keep a close eye on the engine temperature and stop every now and then to scrape the locust glue off. The fact that many public roads lead through cattle stations (ranches) also means that once you turn off that main road/track you are on private land and are actually trespassing. So find out beforehand if you are allowed to drive to a certain waterfall located on a sidetrack. All it usually takes is a phone call to the station owner/manager to get permission. They like to know who is on their land, just like you'd like to know who is poking around your backyard. One more thing about driving on Outback cattle stations: you will come across many gates. They are there for a reason! If they are open, leave them open. If you find them closed make sure you close them again! During the wet season in northern Australia (November - April) you will encounter other difficulties. Many Australian Outback roads are impassable during that time of the year, and will be closed. If you ignore the closed sign you risk a fine of $5000 and you may lose your licence. An open road is no guarantee! The weather can change suddenly. A downpour many kilometres away can make a creek swell enough to stop you from driving across. Flats can be treacherous. They look dry on top, but underneath... bottomless mud. Take care, and if in doubt get out and walk across to check. If a road is open for four wheel drive only (as opposed to the ubiquitous "four wheel drive recommended") then there is a good reason for it. Either deep water on the road, or rocks and boulders that require high clearance, wash outs that a normal car can't climb through, steep banks... You will need a four wheel drive vehicle. 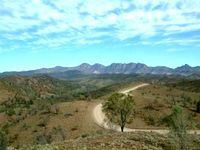 This site offers advice for driving in the Australian Outback for the average traveller, not the extreme 4x4 enthusiast. I will not go into details and the how to of recovery methods, but I will give you some general tips. First of all, it happens to the best of us: we get bogged. So don't panic. Get out, have a drink, look at the situation and your options. Whatever you do, stay with your vehicle, unless you know for sure that help is nearby, and you know for sure how to get there. Often it's not as bad as it looks. Here are a few tips that might get you out of trouble. Plenty of water and plenty of fuel (you may use a lot more than on the highway...). A good high lift jack and something to use as a base plate for it. A tow rope and a snatching strap, a couple of shackles. My car is also equipped with a winch, so far I haven't needed it. If I'd ever go somewhere really, really deserted I'd have a satellite phone. Don't spin the wheels and get yourself deeper into it! If you're in deep sand, deflate your tyres. Yes, it works. Believe me. My car is useless in sand (little power, little clearance) and I have to do it all the time. Try 25 psi to start with, go lower if you need to, provided you carry a small compressor. You have to reinflate the tyres when you get back on firm ground. A small compressor for emergencies is very cheap, and I would not be without it. Sand or mud: Use a shovel to dig away sand or mud in front or behind the wheels (and under the diff if necessary). Collect material to put in the wheel ruts to provide some grip. Stones, timber branches, grass... Use the jack on a plate (or it will just sink) to lift the car and put some materials under the wheels. You might have to do this several times until you are back on firm ground. And don't despair if it doesn't work straight away. Keep trying. While working make sure you drink enough, wear a hat and have breaks. Consider waiting for the cooler time of the day. You're not helping anyone if you get heat struck on top of getting bogged!